Need trade show giveaways ideas? 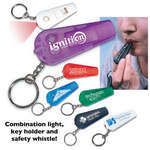 Thinking lighted key tags with logo options that help you promote your company might be a good one? Well, we think you're right. 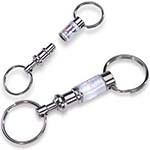 These lighted keychains' promotional potential is only limited by your imagination. Use them on your employee fobs to make sure your team is never in the dark, or hand them out at your next conference to ensure potential customers and partners are thinking of you every time they shine a light on their car's keyhole. 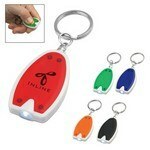 Brighten up people’s lives and be your company’s guiding beam of light, with the 1 shape led key chain. 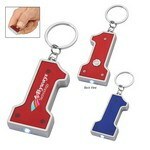 Emblazon your company’s logo on the fun shaped key chain, to make your brand’s best first impression. 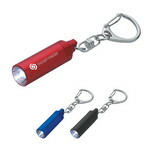 The 3 LED Super Bright Keylight is durable metal easily fits in your pocket. 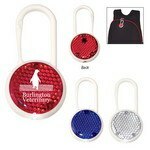 The Bright Illuminated Logo Keylight has exciting light-up imprint area with a push of a button. Your logo will glow in all situations, especially at night out on the town! Promote your company, reaching anyone who sees it. Choose a color combination that best compliments your logo or event. 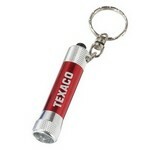 Confront power cuts and emergency situations that might arise in the dark, with the LED key chain. 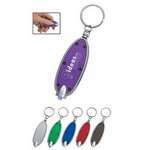 Customize this key chain, by adding your company logo on the plastic finish, to effectively promote your business. The Micro LED Torch/Key Light is a compact LED flashlight. 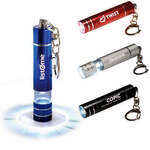 This mini aluminum flashlight with latching key holder has an ultra bright LED bulb. Pack some flashlight power in your keys, and never get lost in the dark again, with the rectangular LED key chain. 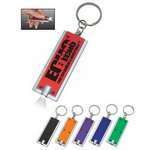 Emblazon your company’s logo on the rectangular key chain, to make your brand’s best first impression. Add flashlight power in your keys and never get lost in the dark again, with the round LED key chain. 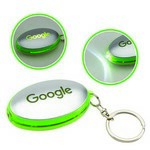 Emblazon your company’s logo on the round key chain, to make your brand’s best first impression.